This dataset contains all numeric data reported on a cost report such as costs, charges, ratios, number of hours in work week, etc. It has information on the Home Health Agency (HHA) cost reports received by Healthcare Cost Report Information System (HCRIS). 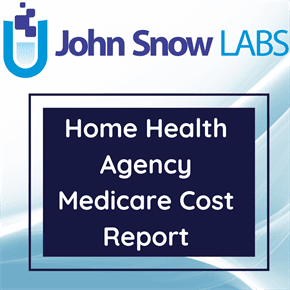 Home Health Agency Medicare Cost Report data files contain cost reports for the year 2017. Among the 4 files of The Home Health Agency (HHA) cost reports, the HHA Cost Alphanumeric Table 2017, HHA Cost Numeric Table 2017, HHA Cost Report Table 2017 and HHA Cost Rollup Table 2017, the ‘HHA Cost Report Table 2017’ is the parent of the other tables and contains the unique primary key field Report_Record_Number. The field Report_Record_Number is the foreign key in the other 3 tables. That is, all data in all tables are related by the value of the field Report_Record_Number. The data files contain the highest level of Medicare cost report status. If HCRIS has both an as submitted report and a final settled report from an HHA for a particular year, the data files will only contain the final settled report. If HCRIS has an as submitted, final settled, and reopened report from an HHA for a particular year, the data files will contain the reopened cost report. It is possible for 1 HHA Provider to submit 2 or more cost reports for a given year for the same cost report status. This may happen if a Provider changes its FY, or if there is a CHOW (Change of Ownership) during the year. To use the HHA cost report database, it necessary to determine the data interested in by reviewing the cost report forms and the data specifications. The Worksheet ID, line, and column specifications need to be known to pull the data from the cost report form. For example, to extract the data for “Home Health Agency-Number of Skilled Nursing Visits Title XVIII”, determine where this information is collected in the report and use these elements as parameters to pull the data from the HHA_RPT_NMRC table.